In all my research, which was mostly internet based, I didn’t come across one important factor that has changed the way I handle our raw goat’s milk. It was brought to my attention by another one of my wonderful neighbors. She has had goats for 8 years or so and gently let me know that the way I was cooling our milk was unsafe. She told me that even placing it in the freezer for an hour only cools it to 50°F. And it takes 105 minutes for it to reach 40°F. She said the fastest way was an ice bath. She loaned me a book by Mary Jane Toth called Goats Produce Too! which gives the above information and more. After looking the book over, I changed the way I do things. 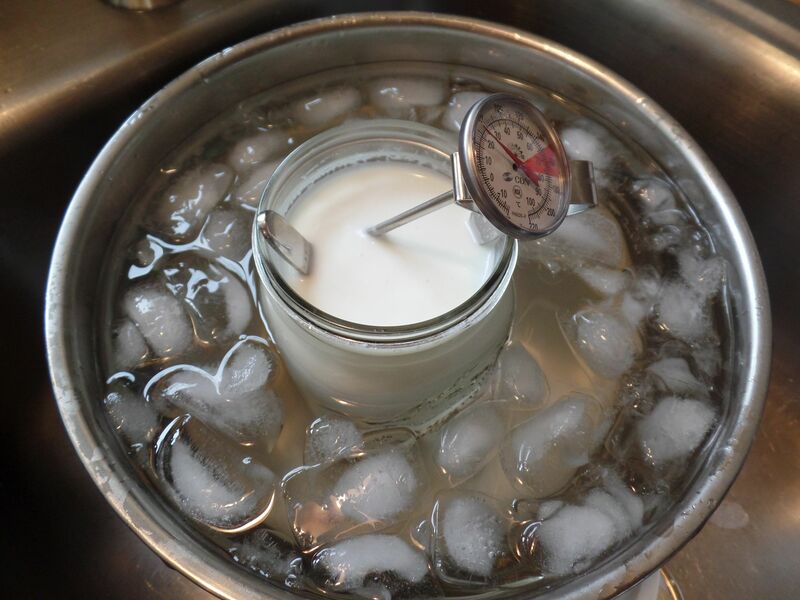 Now when I get in from milking, after filtering and weighing the milk, I plunge it into an ice bath. I set a timer for 30 minutes and stir it periodically. (It’s actually easier if you leave the lid on and shake it once in a while and swish it around in the ice.) At 30 minutes I check the temperature. The best I’ve gotten over the last couple days was 42°F in 30 minutes. I purchased the beverage thermometer pictured above at our local URM. I think it was only $6.99. met. A hand-written log can be used. I also found it helpful to read this Parent Safety Guideline. After learning all of this, I pulled about three gallons of milk out of our fridge from the past week and poured it all into gallon freezer bags. I will use it for soap! This entry was posted in Food, Goats, Happenings and tagged raw goat's milk, raw milk. Bookmark the permalink.